Passion sparkles from the crystals in their eyes and at the rocks below them. 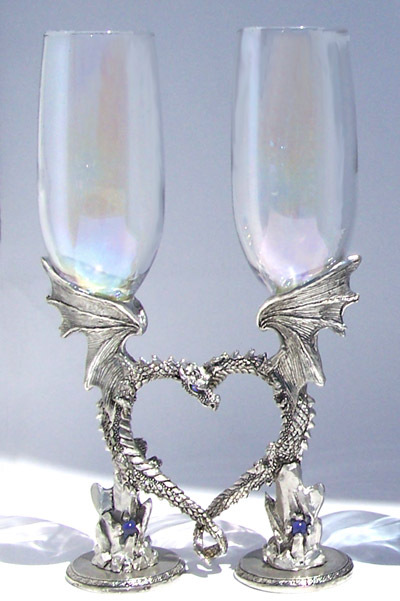 When these glasses are set together the dragons nuzzle, their tails entwine, and the space between them becomes a heart. We make them by hand from lead-free pewter, crystals, and fine glass. Sold as a pair, each dragon can hold 8 ounces. *(Our color options below list Glass Color first, then the color of the crystals.) For our life-long GLASS REPAIR GUARANTEE go to "Cleaning & Glass Repair" near the top of our home-page.